There are a few things that don’t quite work in Baltron, but you can’t say Toei Animation didn’t try to add value to this obscure, humble shooter which only saw release in Japan. There is a cinematic opening inspired by Star Wars, complete with a scrolling text explaining the motives behind a desperate attempt at stopping villain aliens from conquering a pacific planet. 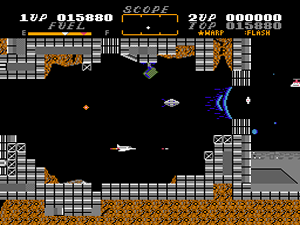 On the gameplay front there is a healthy batch of inspiration drawn from arcade classics such as Defender, Scramble and Asteroids, all of which supposedly serve to spice up the action in the single long stage that comprises the whole game. Truth be told, if you count the exit of the cave as a stage delimiter then you have seven levels seamlessly connected by non-stop action. Since the scenery doesn’t change much during half the game and there's only one final boss at the end of the stretch many people consider Baltron to be made of a unique long, loopable stage. It's kinda like Scramble itself or Transbot on the Sega Master System, only without a stage map or any strong visual identity. To warp or not to warp? For a game that's so simple there's surely a lot of information on screen. Up in the middle is the Defender-like scope radar that shows the threats that sneak ahead of you, which of course doesn't do much to help unless you're flying slowly. The closest you are to the right the fastest the scrolling will be, so if you lean against the left border of the screen things will pass by very slowly. While that certainly helps you survive in the beginning, it soon becomes impractical due to two factors: fuel depletion and enemies dangerously coming from behind. Button A is responsible for firing the single shot and the air-to-ground bombs, whereas button B must be used in conjunction with the directionals to have any effect on the gameplay. When pressed with ↑ you unleash a "flash" that clears the screen of enemies, when pressed with ↓ you activate an Asteroids-like warp to skip a small portion of the level, and if used with ← and → you change the flying direction. Switching flying direction can be done at will, but the flash and the warp consume some energy and can only be used if the fuel reserve is above some markers. The limit for flash is the red marker and for warp the white marker, but you can also watch for their specific indications in the opposite side of the score counter in the HUD. While interesting on paper, the execution of the special moves/attacks with button B is as failed as the game's attempt at emulating the gameplay of Defender. Firstly, there's no reason at all to fly left in Baltron. Secondly, the warp command is two times annoying, first because at the beginning you're prone to doing it by accident, and second because after the warp you might return in solid matter and die instantly (never use it inside the caves!). 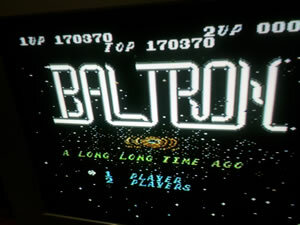 Getting through the stages in Baltron is strangely addictive despite the bare bones nature of the gameplay. Once you learn there's only one point where it's possible to completely reload the fuel reserve this detail becomes less worrysome. Each level consists of two halves: an open area where you'll allowed to fly everywhere and a cave with varying degrees of obstacles. With the exception of one stage (4th), right before the entrance of the cave there's a pipe coming out of the ground that spews a blue canister that completely refills the fuel reserve. If you don't destroy the pipe and wait a little it will also release a yellow canister that gives temporary invincibility. The problem with these items is that they can be destroyed by your own shots, so watch out for that whenever you are low on fuel. Also don't forget that the same happens with the fluffy panda that's worth an extra life. The incremental addition of one or two new enemies in every level is what gives Baltron its rudimentary sense of variety. Besides the omnipresent minuscule tie-fighter lookalike (Star Wars! ), the bad guys also send creatures that look like paper darts, medusas and lice amongst homing saucers and invincible Capcom yasichis that reflect all shots and mean instant death if you stand still in front of them. Energy barriers fade if you manage to destroy one of their tips, and some ground/ceiling turrets seem to jam when they start blinking, so take your shot at them if this happens. All flying enemies are able to go through walls, therefore don't expect to be safe at any moment inside the caves. In my best run I was able to reach the beginning of the third loop with the high score shown below. Apparently each new loop comes with a color palette swap and more aggressive enemies.